Cath, Thomas, Frances and Isobel followed two other cars from the roundabout at NS which were going to the start of the walk too and we all turned off into Penninghame farm buildings, as directed by Jim. We met up with the other walkers: Robert, Richard, Ken, Peter, Carl, Margaret, Audrey, Duncan, Irene, Linda, Mary, Allan, John (on his motor bike), Rachel, Heather, Leslie, Christine Sloan and lastly, Catherine! A bright but crisp sunny morning saw twenty three walkers gather in the Mains of Penninghame farmyard for the walk. Thanks must go to the farmer for the parking arrangements. 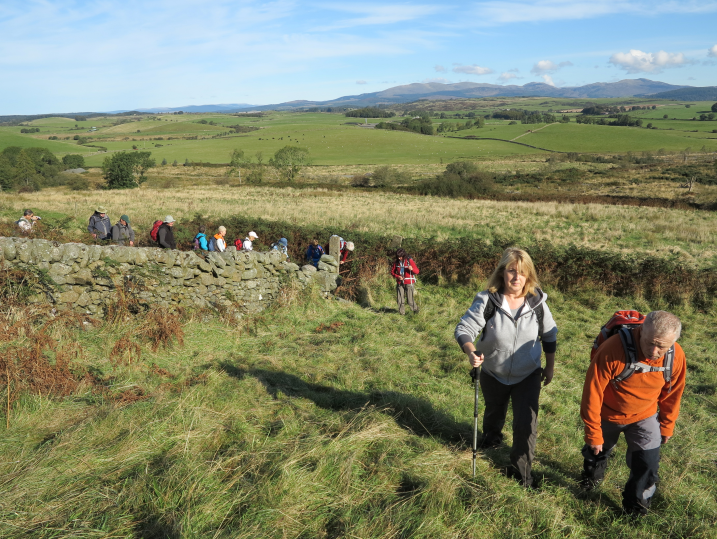 The walk started by following a farm track south to the Wood of Auchleand. A friendly wave was given to anglers at a popular fishing pond. (After) A short distance along a forest road a rough track was taken to ascend White Hill. After surmounting an awkward ditch and dyke and long wet grass the hill top was reached via a cattle grazing field. 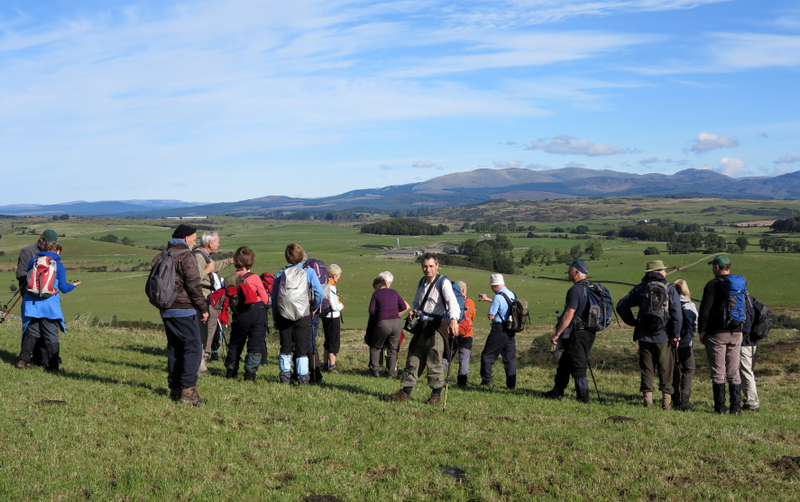 A short break was taken to enjoy the wide panoramic views across Wigtown Bay and north to the Galloway Hills. The sunshine made this a great day for photographs. A gradual descent brought them to a farm track. A herd of cattle decided to precede the group along this track. A farming member of the group was dispatched to herd them together to allow the group to pass. This transition was successful but muddy and Auchleand Farm was reached. The track was extremely muddy and concentration was essential in negotiating it. 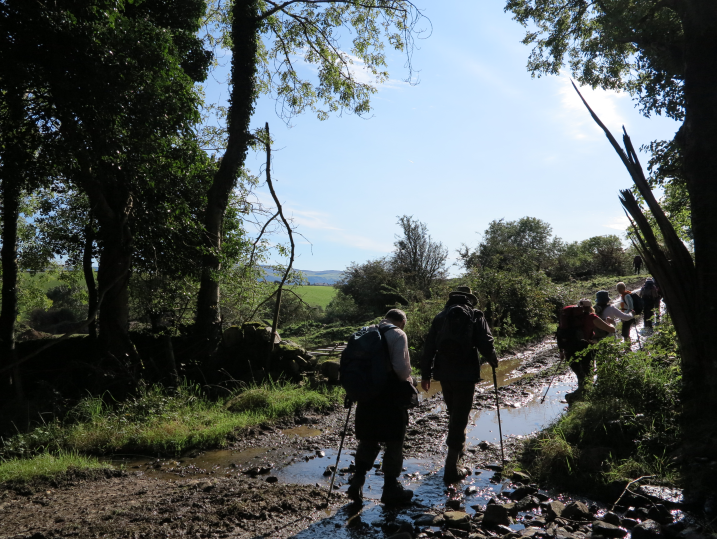 However, my mind was elsewhere at this time, having realized that no provision had been made for the group to get their essential refreshments at the end of the walk. After a long search for its phone number, I managed to contact Cinnamon, the cafe thought to be the most central one for us all. 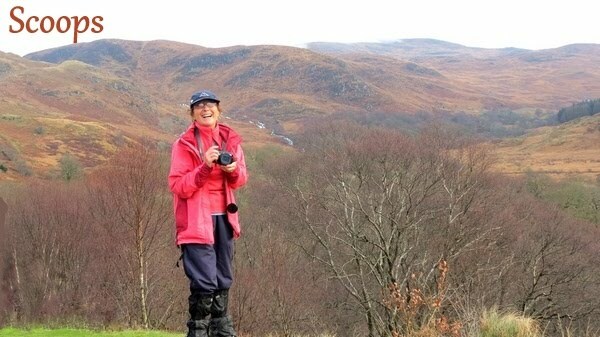 When we reached firmer ground I did a count of all the scones required and phoned Cinnamon who offered to bake another batch of fruit scones! What a relief! After passing through Auchleand Farm a solid track was followed to reach the main Newton Stewart to Wigtown road. Here another short break was taken to talk to the farmer and to learn of a cattle track that could be used on future walks, taking out the need for walking along the busy A714 road. Now the busy A714 was followed in single file for almost eight hundred yards north before turning in to Carsegowan Cottage. Here a delightful surprise greeted the group. 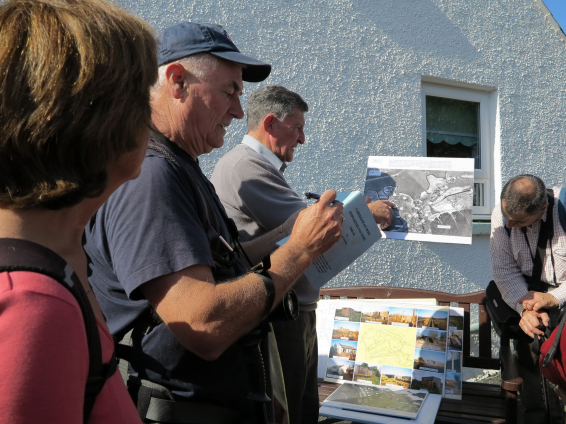 Having learned of this walk taking place, Dennis Sawden, the author of the book “Carsegowan Moss Explosives Factory”, gave the group an outdoor presentation of history, facts, plans and photographs of the former ICI plant. After the enthralling talk, Mr Sawden was thanked profusely and the group continued into the works. Jim made sure that he got the author’s signature in his copy of the book. Now the walk went through the northern end (Unit2) of the ruins. The largest concrete structure they passed was identified as 'Incorporation Runner Mills' within which nitrate, sulphur and charcoal were mixed by rotating rollers set in a metal bowl. 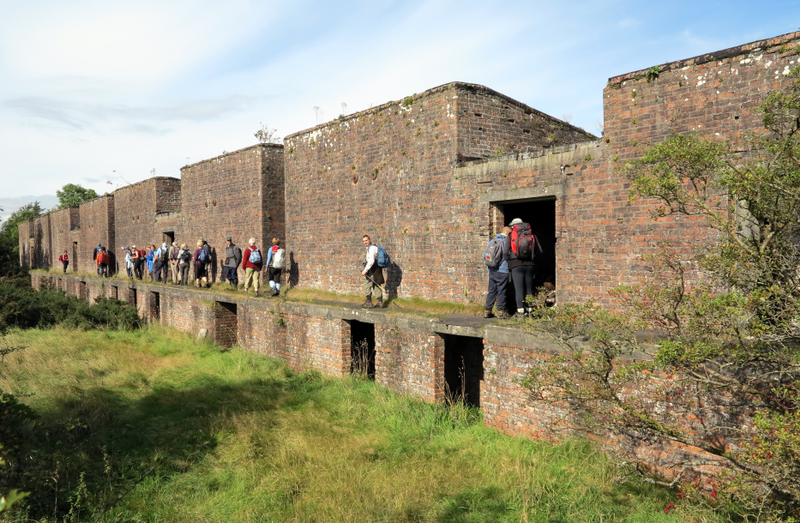 Bunkers, Press Houses and Magazines were amongst other structures Identified. We had gone along a good wide track and were approaching a metal gate aimed at deterring motor access when we were met by a man in full camouflage combat clothing, including a mask which covered his face, except his eyes and mouth, carrying a huge gun with a long-range sighting and holding a knife. He was extremely scary and it was a relief when he took his mask off and told us ‘you are in a dangerous place here’. Jim agreed, saying that we had kept to the obvious routes and not wandered where we should not have been. The weird man said that what he had meant was that he was there to cull the deer who were destroying the new trees and that we could have been shot. Now, as it was, we would have scared them off and he would have no chance of finding them. He became slightly less threatening and we walked on along the planned route! After completing a circuit, lunch was taken by the old Home Guard quarters. There were a dozen chairs in one of the buildings which we took outside so some of us had a reasonably comfortable seat although the surroundings were pretty unattractive. It seems that these chairs, a table and some papers left there, indicated that the building is used by a scouting group. After lunch the group made their way to Carsegowan moss. This raised moss is one of only a few left in Britain. 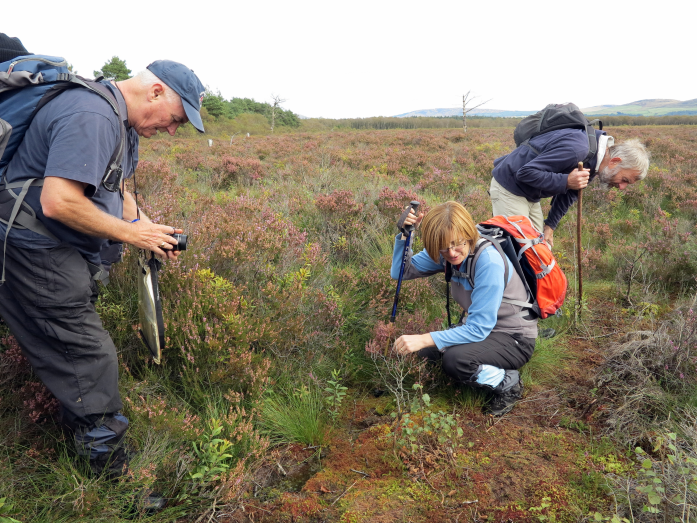 The surviving bog is blanketed by sphagnum mosses and heather amongst which lichens, bog asphodel, cranberry and sundews can be found. Various plants were identified, and the elusive sundew was photographed. The walk leader also mentioned the RAF plane crash on the edge of the moss in 1942 which resulted in the death of all five crew, two of who are interred in Kirkinner graveyard. 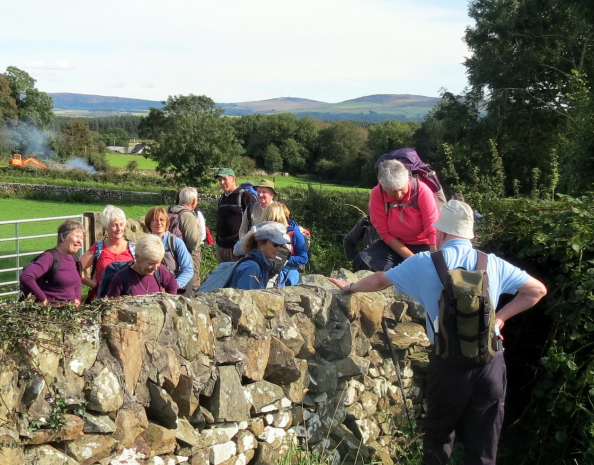 Leaving Carsegowan, a track alongside the old railway line took the group up to Bishopburn Bridge from where they followed the old road running parallel to the A714. The A714 was crossed at Causeway End where the minor road north west was taken. A short way along this road a stile over a drystane dyke accessed a grassy field which led to the disused Newton Stewart to Wigtown railway track. The track was now followed to reach the old graveyard at the Clachan of Penninghame. 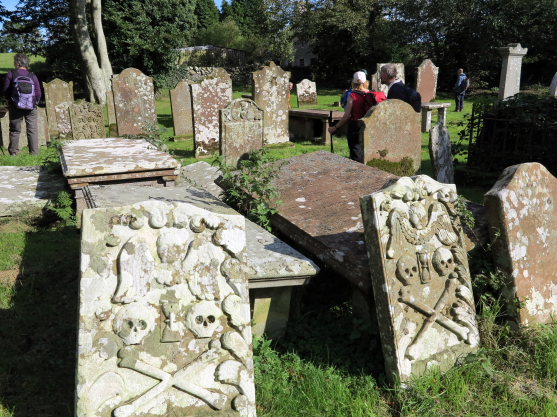 Headstones, some dating up to 300 years old with familiar local names were viewed. It was noted from certain headstones that in many cases there was continuity of ownership of farmland and property. Back on the minor road they continued north to the T junction at Barwhirran Croft where a depression in a field goes by the name of Foul Hole. Half a mile west the Mains of Penninghame road was taken back to the walk start. Enjoyed by all, the day was capped with a visit to the Cinnamon Café in Newton Stewart for tea and scones.